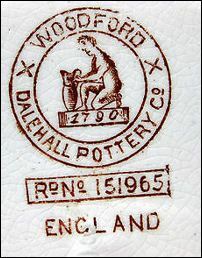 Earthenware manufacturer at the Dale Hall Works, Longport, Burslem, Stoke-on-Trent. 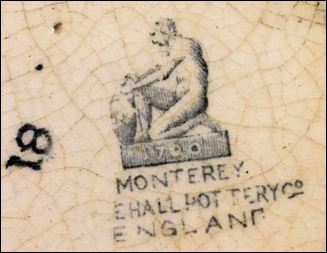 The Dale Hall Pottery Co appeared to be in operation for one year only (they appear in both the 1892 Keates and 1892 Kelly directories). 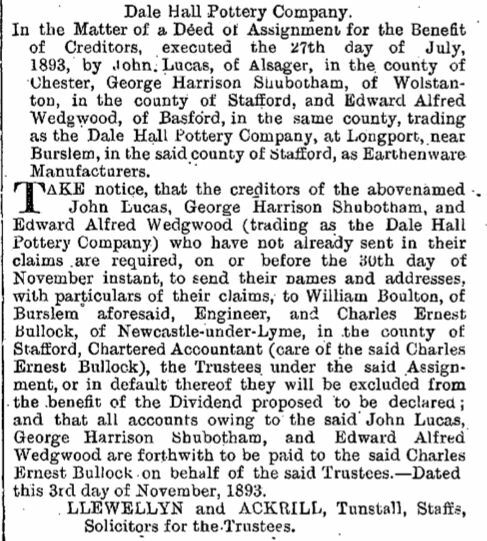 The partners were John Lucas, George Harrison Shubotham and Edward Alfred Wedgwood trading as the Dale Hall Pottery Company. They were concurrent with Keeling & Co (1887-1936/7) and would have shared the dale hall Works with them (this was a common practice). to try to give their ware some sense of history and value. 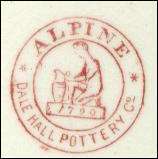 The occupiers of the Dale Hall pottery works used the date "1790"
- which was the date the works were first built by Joseph Stubbs.